There are days like this when being a kid again is just what we need. We wouldn’t have to think about our weekly chores and monthly bills. We wouldn’t have to think about how we might look or how we should be in public. We wouldn’t have to worry about our social status and our personal ambitions. We would be kids. Again. Wearing pea dotted jumper and pink boots, we would jump in the mud and roll over crunchy leaves. We would dance at the super market and smile to strangers without looking crazy. We would stuff ourselves with jellybeans, muffins and cookies without thinking about calories and gaining weight. We would ride rocking horses and go on the swing screaming: “Higher! Higher! I want to touch the clouds”. We would be kids. Just kids, if only for one day. Just one day. At least we can always pretend to be kids, only older kids, by stuffing ourselves to one of these healthy and hearty Rutabaga and Cilantro muffins. 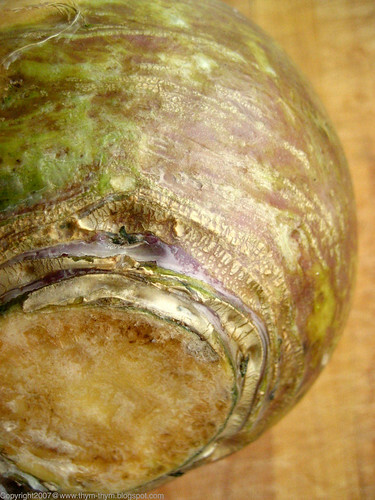 Rutabaga is such a fascinating and intimidating vegetable in appearance, and resembles parsnip and cabbage in taste. 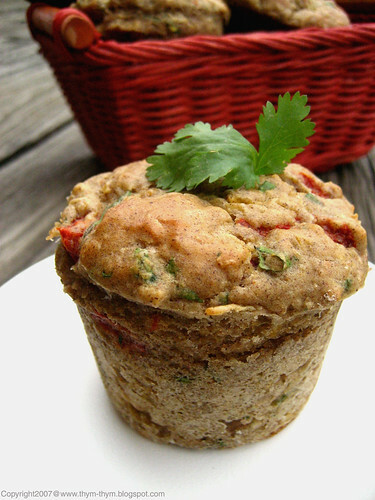 I used it in these savory muffins along with cilantro and roasted red peppers to add a little bit of sweetness to the batter. The taste of the rutabaga is very mild in the muffins comparing to the time I made a rutabaga soup. Not a good experience. My hubby ate it just because he is too polite or was too hungry. And I finished my bowl just because it was “good for me” and because I don’t like to mistreat my soups. I am a nice kid. The use of buckwheat flour can be substituted for another nutty flour of your choice, such as chestnut or chickpea flour. This muffin would be a perfect pair to a soup or a spicy arugula and pear salad on your thanksgiving dinner. In a bowl, stir together the all-purpose flour, buckwheat flour, baking powder, salt, ground black pepper, cilantro and the ground coriander. Beat the eggs until blended. Add the milk, oil, honey, red peppers and shredded rutabaga and beat until blended. Add the dry ingredients and mix just until moistened. Spoon the batter into the prepared muffin-pan cups. Bake for 15- 18 minutes until a toothpick inserted in the center comes out just a little moist. Do not overbake them. These muffins can be stored for up to 2 days in an airtight plastic container. The muffins are good on the first day and even better on the second. Préchauffer votre four 200C. Beurrer et fariner un moule à muffins de 12. Dans une jatte, mélanger les deux farines, la levure chimique, sel, poicre, coriandre et graines de coriandre. Fouetter les oeufs un peu, puis ajouter le lait, l’huile d’olive, le miel, rutabaga et poivrons rouges et batter jusqu’ à ce que tout soit bien incorporé. Ajouter alors les ingredients secs et mélanager juste afin que le mélange soit bien uniforme. Ne pas trop mélanger afin d’avoir des muffins tendres. Verser la pate a muffins dans votre moule a muffins et faites cuire pendant 15-18 minutes, jusqu’ à ce qu’un cure-dent inséré à l’interieur des muffins en ressort à peine humide. Laisser refroidir dans le moule sur une grille à patisserie pendant 2 minutes, puis démouler. Servir accompagnés d’une soupe ou une salade de roquette ou de frisée. Ces muffins sont délicieux le premier jour, mais encore meilleur le second. Ils peuvent se garder pendant deux jours dans une boite en plastique à fermeture hérmetique. Rutabaga and cilantro muffins? I can't even imagine what these taste like!! You know what that means? I'll be making these this weekend. :) Looking forward to it. Now I have a very good french book of Veronique Chapacou with a salted creme brulée rutabaga/nuts, I must try it !!!!!! Rose, what a fun thought - to go back to childhood...it would be very, very nice sometimes! Muffins look fabulous - and I wouldn't change a thing. Buckwheat flour has such a unique taste. Lovely. I like the picture of DD too. These sound completely nuts -- I can't imagine how they could possibly taste! I can't wait to try them! Your muffin recipe left me with a puzzled look on my face. All those ingredients? It's just far enough out of my comfort range to give it a try! This muffin is really interesting. I love Rutabaga so I will give this a go! - Shivapriya, thank you veru much. - Wendy, I hope you will like them. They are even better on the second day. Just don't overbake them to have a moist muffin. - Marion, your crème brulée sounds very interesting. I'll be checking your blog to see when you post it. - Lucy, Thank you very much my dear. I am really enjoying buckwheat flour in savory things, like drepes and muffins. - Delicieux, Merci. It was my first experience with rutabaga, and I wasn't desapointed with these muffins. - Shayne, I get that look on people faces many times and I often wonder what is it with people these days that they can't even return a simple smile. - Chris, hahahaha!! Nuts? they aren't that bizarre when you taste them. Trust me. - Nan, I guess it's just people personal tastes and I respect your puzzled look. But really when you have a bite of it, you will notice that the ingredients come together just fine. You can't even notice the taste of the rutabaga. - Anh, please, let me know if you do try it. And I hope you will enjoy it. Where did you find such a handsome rutabaga? The one I brought home the other day was ugly, but it tasted marvelous. And those muffins! Who would have thought to combine those ingredients! I must try these. 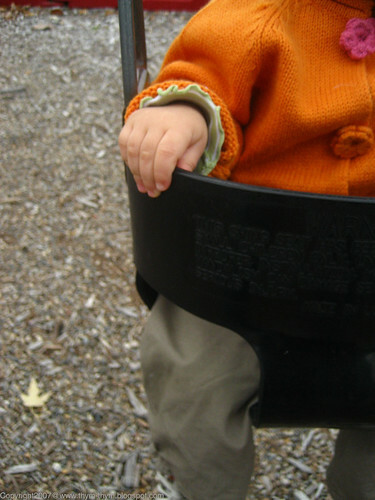 Great post Rose and I love the little sweater on "the kid"! Early on in my own Blog, I wouldn't shut up about muffins. You're bringing it all back - Muffins are one of the best foods in the world! Yours look incredible, if ever a muffin could look assertive, this is it. I know exactly what you mean about that desire to be a child again. I'm only 20, but I often think about the times when I'd come home from school, watch cartoons. Eat. Do whatever I wanted, then go to bed. Weekends were the same, just without the school bit. Don't you get sick of thinking: "Oh, but if I do/don't do this, that will/won't happen."? Rutabaga in muffins? I never would have thought. But I sure would taste. And those photos...oh, my. - Deb, Michigan's rutabagas are known to be very handsome;)I hope you will enjoy the muffins, Please le me know how it goes. Thanks for the kid. It was a gift from her sweet aunt. - Graeme, Thank you very much. Early on in my blog I couldn't shut up about cousocus. Since then I've learned there is so much more to share. - Susan, thank yu very much my dear. Give them a try and let me know what you think. I wish I could smile at strangers who look kind too....it would make me seem crazy though! Hi Rose, I've not heard of rutabaga before. I love parnips, so I will have to look out for rutabaga at the market. I like the idea of savoury muffins. Thanks for the recipe. p/s: love all the photos! Hi, I found your blog on the web. I'm from Michigan too (Royal Oak) and I'm the proud owner of a real 64 sqft kitchen too. I'm going to try your rutabaga muffins, it's my favorite veggie. - Nabeela, I would rather look crazy than being disagreeable. Don't you think? - Gloria, thank you my sweet friend. I would b playing and dancing with my daughter all the time. - Nora, I saw rutabaga for the first time about two years ago and didn't know what it was. It's actually the first time I try it, and I am pleased with the result. And for trying it. PS: thank you my dear. Nice to see you again. - Janet, I love Royal Oak. I am from Farmington (which is less than ten minutes away from Royal Oak), and welcome to my blog. I hope you will enjoy the muffins. Please let me know how you like them. - Mima, oui c'est comme du navet mais 4 fois plus gros. Mai tu le verras de tes propres yeux bein assez tot. J'ai hate d'etre a l'annee prochaine rien que pour ca. Bisous. A donner envie de manger des rutabagas!